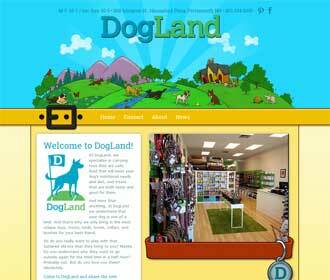 A WordPress website for a boutique dog supply store in Portsmouth, NH. A local business was starting a new dog supply business and needed a web presence. Graphic Details worked closely with the client and created a logo and page layout for the business’s website. A fun, whimsical graphic design was provided by Graphic Details from Portsmouth, NH. The design was in layered Photoshop PSD file. This design was used as a model to create a WordPress theme. A fast, mobile responsive WordPress website was developed for this new local business.